Sniper Jack Cassidy came home from Faluja, Iraq, a hero severely wounded by an IED, and, after having his face rebuilt at Walter Reed Hospital, got off on the wrong track because of his facial disfigurement. He finds his true self again as he helps Juanita Delgato, a victim of human trafficking in Dallas, return to her family in Mexico. He, Juanita, and a private detective, Joe Chapin, with his fiancé Lucy, trace the traffickers to the Milton Shipping Company in Dallas, and eventually confront a gang in Nuevo Laredo which has supplied girls and drugs to members of the Dallas Company. 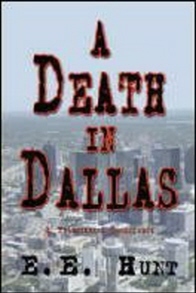 Read the transcript of a conversation with Exclusive Magazine's Russell A. Trunk about A Death in Dallas HERE. Links to additional resources relevant to "A Death in Dallas".